Update: This class was initially created as a playtest, and I appreciate all the people who downloaded this module (over 600 to date)! I cannot convey how much it means to me to have people play as my Necromancer class, and then reach out to me with feedback! This process has been awesome, and I thank you all so much. While the playtest has now closed, I'll leave this class up on the DMs Guild as a PWYW title. Please feel free to download it for free and use it in your games! It will not see any more revisions unless there are bugs in the module (let me know if you encounter any!). If you want to see the evolution of this class, check out my 5e Pale Master class (what this playtest eventually become), which can be found below in a Fantasy Grounds Class Pack, or as a stand alone PDF of the class. I've a created necromancer class for 5e. It is based on the Warlock's Pact Magic casting ability but contains more traditional archetypes, dubbed Requiems. 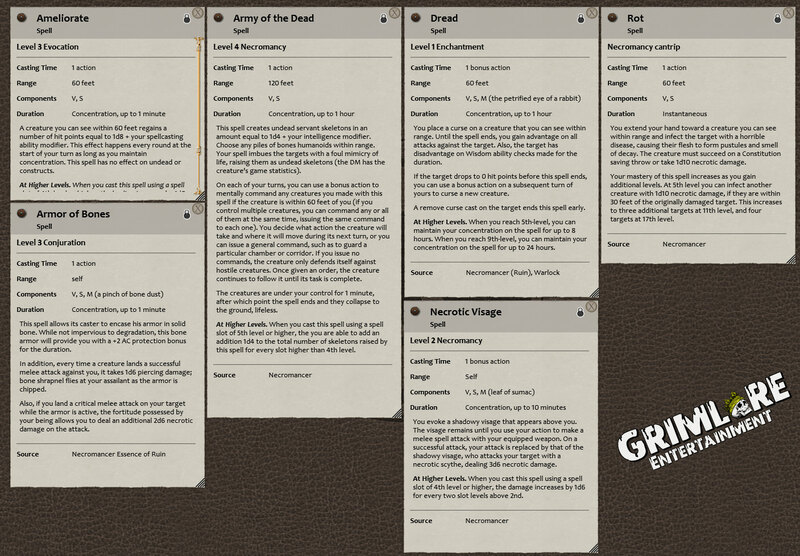 There are also 6 custom spells currently created for this class, in additional to the traditional necromancy list. This listing was made to obtain the community's feedback from those interested in joining me during the creation process for a new 5e class. As such, I've created this class as a Fantasy Grounds module (allowing you to utilize Fantasy Grounds' automation and level up your necromancer like you would any other 5e class). Essence of Ash: Focused on the ebb and flow of life and death. This class also gets a pet! Essence of Decay: Focused on spreading pestialence. This class is closest to a tradiational caster. Essence of Ruin: Focused on melee, gaining armor and weapon proficenies. Is there a PDF somewhere? I wanna try it! Unfortunately not of this class. This playtest ended almost a year ago, and resulted in the Pale Master, a 5e class featuring some of the iconic abilities from 3.5e updated for 5th edition. This title was added to our catalog on April 23, 2018.